As Little Fox gets ready for bed, Mama Fox tells him the miraculous story of his arrival. First there was the waiting: "I'd go up to the cliffs and watch for you," Mama Fox tells her child. Then the mother who had Little Fox made the big decision to give him away: "I think she prayed like crazy that you would be safe, Little Fox. I think she prayed for me as much as I prayed for her." Then, finally, both their prayers were answered, the day God delivered Little Fox to Mama Fox: "When God found us you, you made me the happiest mama in the world." Lisa Tawn Bergren tells this heartwarming tale with tenderness and a true understanding. 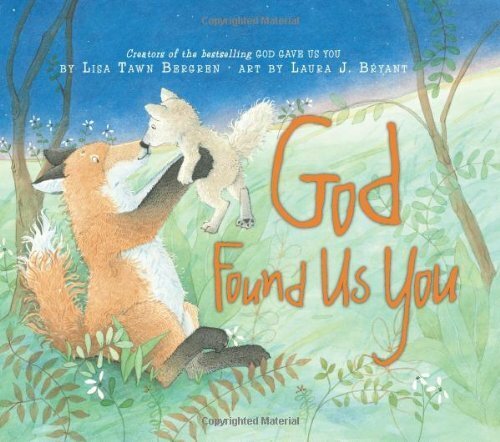 Just as How Big Is God captures the immensity of looking at God through a young child's eyes, this book captures the more intimate, but no less profound, discovery of the blessings that adoption brings to both parent and child.